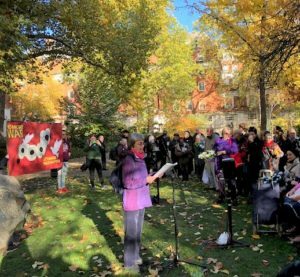 Several hundred people gathered in London on 11 November, members and supporters of the First World War Peace Forum, to reflect on the impact of war on the world and re-commit to building peace in the years ahead. In silence, each of the organising groups laid wreaths and arrangements of white flowers around the CO Memorial. 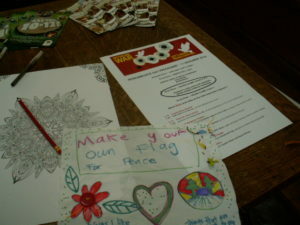 Following on from the ceremony, a peace festival was held in Friends House, bringing together 23 peace organisations. They offered a rich array of resources and approaches to peacemaking including films on the women’s peace movements of the First World War, talks on drone warfare, the contemporary arms trade and the impact of militarisation on schools, and play and craft activities for children and families led by the Woodcraft Folk. At the same time Pax Christi members were involved in events around the country. Catholic parishes in Barnet and Tollington Park met in their Peace Gardens to pray and reflect on our need for peace, in Leeds Pax Christi with J&P Leeds hosted a service and talk on the theme Remembrance is not Enough; St Joseph’s Parish in Guildford hosted an hour-long peace vigil after Mass with readings and prayers calling for a commitment to peace, in Liverpool Pax Christi members joined others at the Peace Garden in the city centre for a peace and remembrance commemoration. 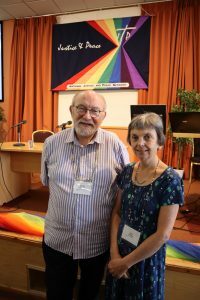 Pax Christi staff and members were part of the 40th National Justice and Peace Annual Conference at the Swanwich Conference Centre last weekend. Pax Christi offered a workshop on the theme ” Same Struggle – Different Place” exploring the issue of knife and gun violence from London to Mexico, from Kenya to Chicago, looking at the similarities of this reality and examining those things in society and culture that allow and sustain this violence. Pat Gaffney of Pax Christi chaired the session of David McLoughlin and Pax Christi’s Peter Hickey managed the Pax Christi resource stall. Pax Christi’s Ann Farr ran a stall on behalf of the Ecumenical Accompaniment Programme in Palestine and Israel. Pax Christi also invited participants to take action on behalf of the Khan al-Ahmar Bedouin community whose homes and livelihood are under threat of demolition.